Purchase order management software is specially designed to manage entire business purchase and sales order activities in simplified manner. 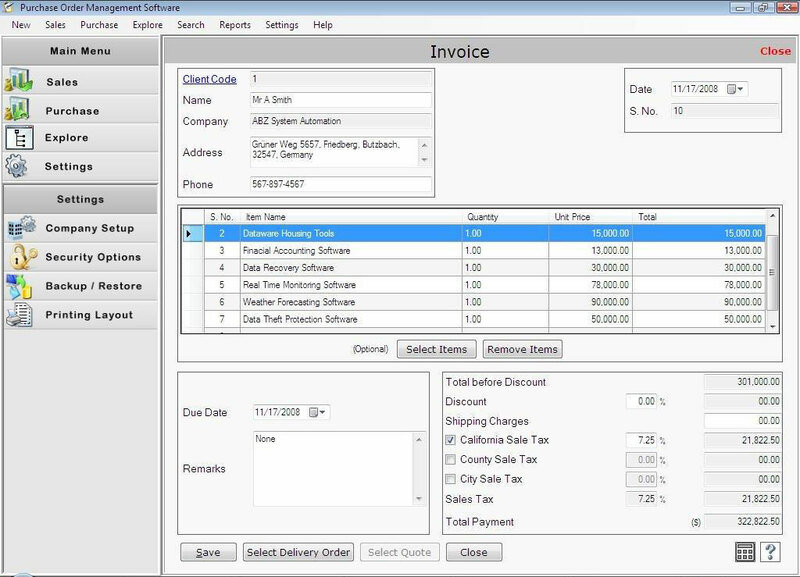 Ready to use Purchase order organizer tool generates various reports like sales reports (Quote Report, Delivery order Report, Receipt Report, Invoice Report, Deposit Report), purchase order reports (Purchase order Report, Purchase Delivery Report, Purchase invoice Report, Vendor payment Report) and other reports (Transaction Report). Purchase order program allows you to maintain company, client and vendor details for small, mid and large business organization. Simplest and Reliable PO organization utility manages entire financial transaction details of company. 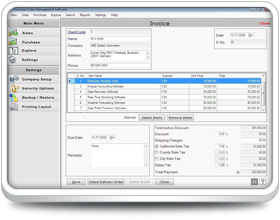 Easily maintains sales and purchase order records in minimal time. Generates business sales and purchase order reports in accurate manner. Create item records along with price in easiest way. Exports transaction records in excel file format. Provides password protection facility that prevents for unauthorized users to access/modify the software setting. Provides data backup and restore facility so that users can easily restore lost data. Facilitate advance option to search entire transaction records just in few seconds. Highly interactive PO management program for small to large organization including Retail sectors, Automobile manufactures, Pharmaceuticals, Import/Export businesses, Warehouses, Transportation and other business areas to manage entire Customer list, Vendor list, Product list at one place. Professional Purchase Order management tool is the best solution to create entire transaction details customer-vender records, sales-purchase records (quote, delivery, invoice, receipt, payment etc) without involving in complex paperwork.